Today we continue with part three of our walk down Baum Boulevard. At the following links you can find part 1 with a look at the former Luna Park, and part 2 with a look at the former Studebaker Dealership. 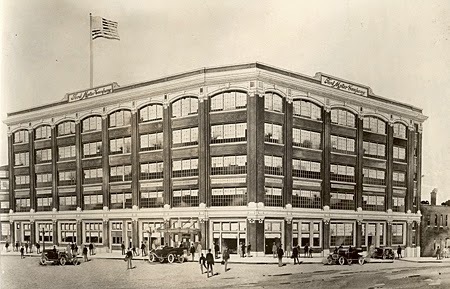 In part three we will continue our stroll down Auto Row with a look at the most interesting, puzzling, and threatened building on the drag, the Ford Model T assembly plant. For several decades the storefront housed a party supply store. After that closed, the building has remained vacant. UPMC supposedly has plans for the building, which are noticeable through the installation of new windows and some general exterior care, but the building still appears to be stagnant. 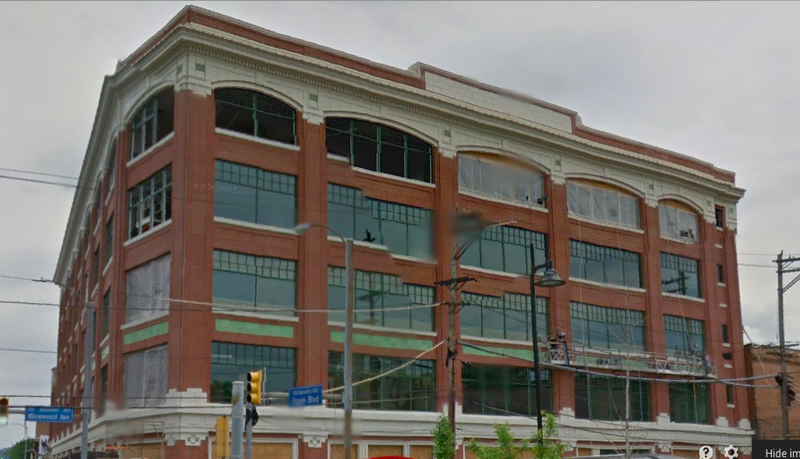 This article from 2011, states that UPMC plans to open a biomedical research building by late 2014, which we are approaching and it does not appear even close to be happening yet. The second photo is supposedly from 1910, although most sources say that the plant was not built until 1915. This Google Streetview shot from 2012 shows the window replacement in progress. During this period that had scaffolding up the sides of the building. Up until this point, the shadowing of the old "Ford Motor Company" cursive logo was outlined in the top section in the middle. Some knucklehead vandal went and put graffiti over the old logo and it was sadly gone after that. I wish I had taken a photo of it. I noticed that old logo when I was filling my gas tank one time at Getgo. That was what initially piqued my interest in this building. 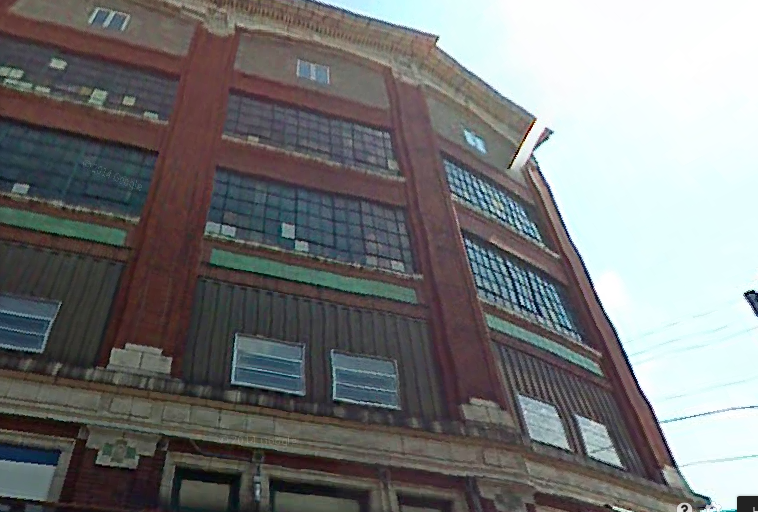 There is not a full on corner view like this in Google Streetview for 2007, but this is how the building looked before the window replacement. The building has definitely seen some love since then. It is slated to be a bio-medical research building, but that information is from back in 2006. This building was part of a series of factories that Henry Ford built that fit into his production line system. Unlike car production today in which automobiles are assembled in one place and then distributed fully assembled worldwide, Ford utilized a system in which most of the parts were made in Detroit and other places in Michigan, thanks to the resources afforded in that region, and then shipped the parts to different assembly plants around the country to cover the different metropolitan areas such as Atlanta, Buffalo, Cambridge, Chicago, Cincinnati, Cleveland, Columbus, Dallas, Denver, Detroit, Fargo, Houston, Indianapolis, Long Island, LA, Louisville, Memphis, Milwaukee, Minneapolis, Oklahoma City, Omaha, and Philly. The car as a status symbol. "We are living in a material world!" 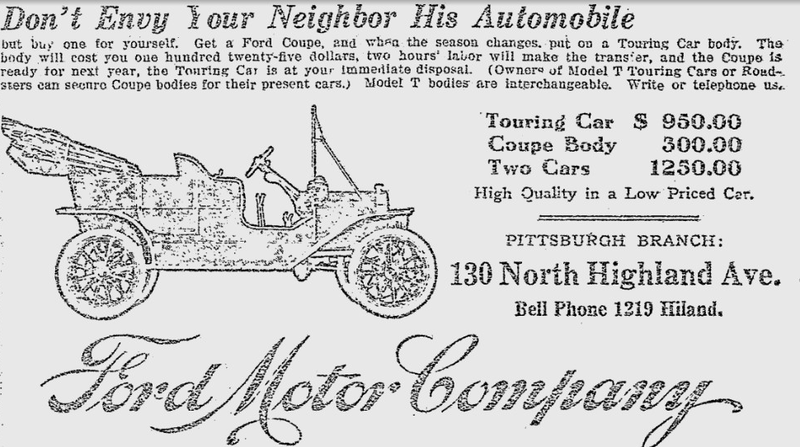 Ad from the Gazette Times, February 13, 1910. I would imagine riding in a Model T in the February weather. When did they start putting heating cores in cars? A graphic touting the automotive operations on Baum Boulevard in 1932. The assembly line shot is from the Ford Plant. It says that the photo on the right is of people working in the Pittsburgh GM headquarters at Baum and North Craig Street. Is this the building that stands on the Luna Park entrance spot? Come 1927 and the plant is already obsolete. 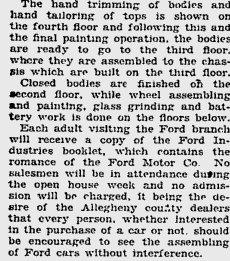 Apparently the plant closed in 1932, and was set to reopen, according to the Pittsburgh Press, November 16, 1936, in the height of the Great Depression. 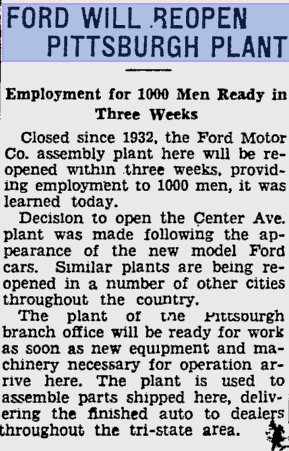 "Employment for 1000 men ready in three weeks" must have sounded pretty good right about then. This plant covered the needs for Pittsburgh. Rather than shipping fully assembled vehicles all over the place, Ford built their vehicles in the communities that they were selling them. This efficiency is what made Ford the pioneer in automobile affordability. Here is the adjacent rail line. The road is the Port Authority's East Busway. At one point this right-of-way was all rail. The parts were all shipped in by rail. Utilizing a complicated elevator system, they would lift the parts needed to the appropriate level. Below is the view from Centre Avenue. Here is the ramp that goes down to the main level of the building. There you go, where you can pull your truck in for loading. Oh wait, never mind! I can totally picture this being a cool movie set. With the booming film industry in Pittsburgh, this would make for a cool movie set. This reminds me of a scene like in Braveheart with him running his horse through the building into openings that lead you into a forty foot drop out of a building. This is where the elevator system took the parts to the appropriate level for production, directly off of the rails. An innovative system, even if it were utilized today. The assembly line system was fully gravity fed, with the process starting on the top floor and then rolling down the factory line to the next stop where another component would be added. The car eventually ended up at street level. Here is an insight into the operations at the plant in 1932: The plant closed for three years starting in that year, so it must not have been long after this tour was given. The Reidbord Clothier utilized the building as a clothing mill until 1995. I am not certain of when they started production at the plant, or when the Ford plant finally ceased operations. 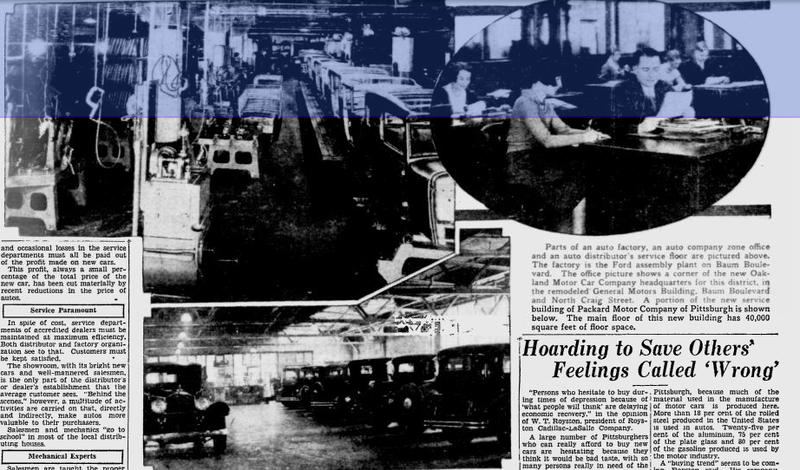 This Pittsburgh Press article from November 21, 1970 outlines a contentious strike at the clothing mill. The improvements seem to be purely for the facade. This photo shows the back of the building, and the other photos from earlier in this post show the condition of the back part of the building. I hope that this building finds usage again as something. I have a hard time seeing it utilized for another purpose though since it was built so specialized for that manufacturing purpose. Cincinnati's reuse could be a good example to follow for this similar plant. They have installed cool murals on the bottom floor windows of the building to show the significance Baum Boulevard's Auto Row. I think this building's cultural value is important. It shows an important part of our nation's history, one in which we should look back to and recreate in the 21st century to create more steady employment. I would love to see this building used for something. It could work for apartments, offices, or maybe even a museum. I hope to see the UPMC Biotechnology Research plan work out, but it seems right now that the building could be endangered.